The authentic, collectible, hardbound (with dusk jacket), Mike Caro University (MCU) version. 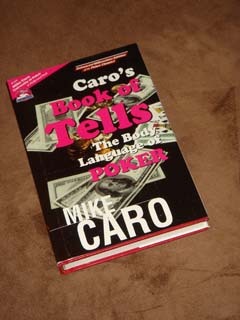 Classic Mike Caro book. Over 170 photos. Explains when players are bluffing, when they aren’t, and why. Determine the strength of opponents’ cards by their actions. This is the hardbound Mike Caro University of Poker, Gaming, and Life Strategy (MCU) edition. Never in the history of poker has one book made so much difference in how serious players approach winning. Mike Caro teaches you the science of poker tells with simple explanations that accompany over 170 photos. Highly collectible. Learn important tells about how opponents will play, even when they’re not involved in a hand. When you master these powerful tells, you’ll own your table. Find out the meaning of trembling hands, shrugged shoulders, humming, and dozens of other small things you might not have noticed that point to pure profit. What are opponents saying about their hands when they appear to be talking about something else? You’ll know for sure after Mike Caro explains it. Discover the real secret meanings behind opponents’ breathing and their eye contact. Use your opponents’ attempts to deceive you against them to win their chips. The tells that Caro defines have stood the test of time and almost no serious player disputes them today. That’s because you will recognize these tells are ones you have broadcast yourself for precisely the reasons he explains! Hardbound.